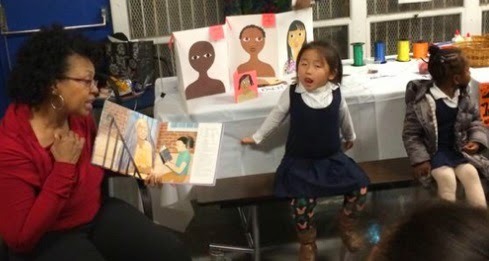 During Literacy Night at a local DC elementary school, Burrowes, along with Seaton art teacher Terry Thomas and Corcoran student teacher led students in a step-by-step hands-on art workshop in which they created self-portraits using cut papers. Adjoa Burrowes read the picture book Destiny’s Gift to young students. Destiny’s Gift is a contemporary story about a young African American girl and her love for books. When her favorite neighborhood bookstore is threatened to go out of business, Destiny, along with her family and community, devise creative ways to save it.